Lose weight and feel great with the ground-breaking Pioppi Diet - as followed by Labour MP Tom Watson who lost 7 stone and 'reversed' type-2 diabetes. 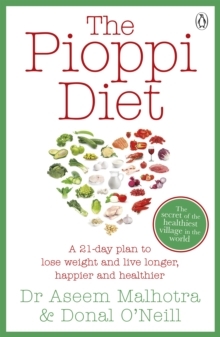 'A book which has changed my life and which has the power to change the lives of millions' Tom Watson, Deputy Leader of the Labour Party 'I am obsessed with The Pioppi Diet . . . I feel leaner, energised, definitely less bloated and more healthy. I genuinely feel like this is no longer a diet plan, it's just the way I eat' Sara Cox__________________ We are not being given the truth about our health . . . We're told to avoid saturated fats, we're marketed health food laden with sugar and we're encouraged to pound out miles at the gym. However, our chances of obesity are increasing - raising our risk of Type-2 diabetes, cancer, dementia and heart disease. Yet in the tiny Italian village of Pioppi, life is as simple as it is long and healthy. There is no gym, no supermarket, the food is delicious and they enjoy a glass of wine every evening. Now cardiologist and world-leading obesity expert Dr Aseem Malhotra and acclaimed filmmaker Donal O'Neill combine the wisdom of this remarkably long-living population with decades of nutrition and medical research to cut through dietary myths and create this easy-to-follow lifestyle plan. This isn't a diet or lifestyle, which requires saying 'no' to the things you love, or exercising for hours upon end. In just three weeks, The Pioppi Diet will help you make simple, achievable and long-lasting changes to how you eat, sleep and move - changes that all of us, no matter how busy we are, can make. Indulge in delicious food for a happier, healthier and longer life such as . . . * CREAMY CRAB and RICOTTA OMELETTE with SLICED AVOCADO* GRILLED HALLOUMI and KALE SALAD with TAHINI YOGHURT DRESSING* STEAK BURGER with MATURE CHEDDAR, TOMATO and AVOCADO* CAULIFLOWER STEAKS and CRUMBLED FETA, ZA'ATAR and CHILLI* ONE-DISH ROASTED AUBERGINE with FETA, HERBS and YOGHURT DRESSING__________________'A must have for every household and a must read for every medical student and doctor' Professor Dame Sue Bailey, the Chair of the Academy of Medical Royal Colleges 'Revolutionary' Richard Thompson, former physician to HRH Queen Elizabeth'This book has the power to make millions of people healthier and happier.' Andy Burnham, former Secretary of State for HealthAs heard on . . . * BBC Radio 2's The Jeremy Vine Show* ITV's Save Money: Good Health* Sky News* BBC World News* BBC Asian Network* London Live Newsand as seen in The Telegraph . . .